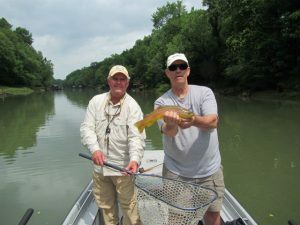 Greg and Steve are best of friends from St. Louis, MO., and last week they made their first trip to the Little Red River for three days of fly fishing. We had to deal with some very difficult conditions all three days as the thunderstorms just kept rolling through the area. With very little generation the water was fairly low and very off color from all the rains. Based on varying generation schedules and very little insect activity we moved all over the river and went through countless flys and both anglers managed to catch a decent numbers of fish for the first two days. 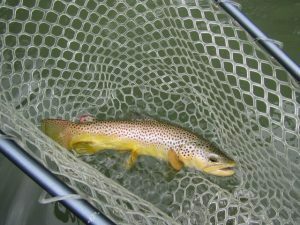 Finally the last day Bo noticed just a few Hexagenas coming off and although there were no fish rising he tied on a new Hex emerger pattern that he has been working on for Steve and the fly did not drift ten feet before it got hammered by a nice Brown Trout. 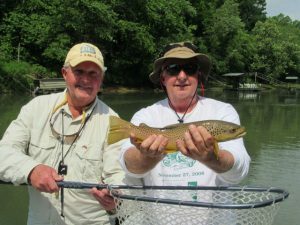 At this point Bo tied on the same fly for Greg and the anglers were on a real roll catching Brown after Brown Trout with six of the Browns measuring well into the slot. 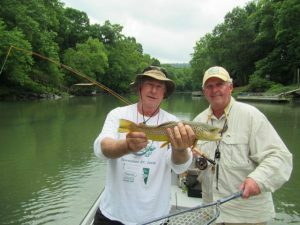 When conditions are tough it pays to move around the river, try different flys and continue to be observant because the fish are there and you have to try to figure out a way to entice a strike. It also helps a great deal to have two good anglers in the boat that understand how to read the water and are willing to stick with it and make the best drifts possible through the most likely lies.